Each season has its tree. 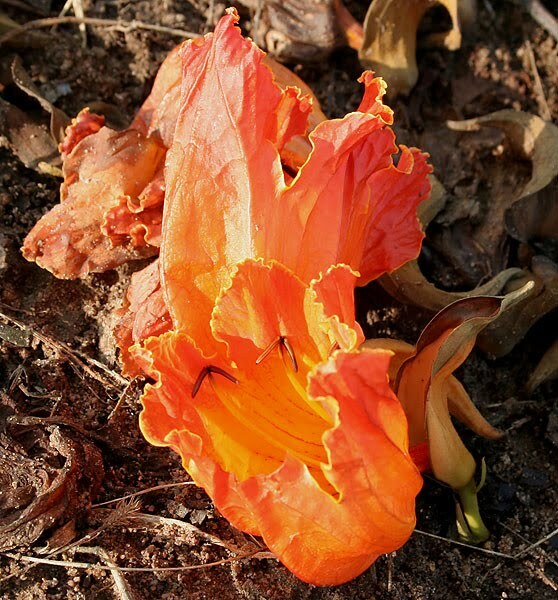 It’s the end of the monsoon and the tree of the season is the African Tulip. The sight of this tree in bloom is spectacular. 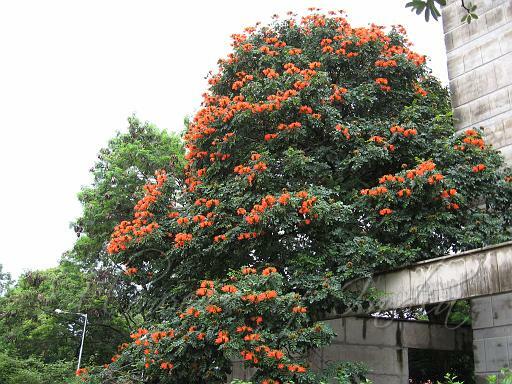 It’s quite high and the bright orange flowers make it look as if the top of the tree is on fire. This adds colour to the city scape. The flowers are quite big and bell-shaped. They fall down from the trees and carpet the roads. Once while I was walking to dance class I came across a street sweeper who had collected a bunch of these flowers which had fallen on the road. He was busy arranging the flowers in circles around the trunk of a tree. I didn’t have my camera so I couldn’t take a picture – but I’m sure you can imagine it. Not surprisingly, the African Tulip tree is native to Africa. It is also known as Flame of the Forest or Fountain tree, and – less romantically – by its botanical name: Spathodea campanulata. It blooms twice a year. The flowers will be back again in the spring. I have always admired these bright flowers, but did not know their name. True, they add a bright and fiery look. i always thought this was called the 'palash' flower and flame of the forest was the 'gul mohar'. yesterday i saw these people cutting a huge african tulip tree also in our neighbourhood...i tried speaking to them but the house owners had all kinds of reasons for it and were adamant. i loved the orange of these flowers against the sky. well probably the metro will be painted in these colours. Don't you think the flower looks like an alapadma hasta? Yes, I've also heard 'flame of the forest' for the gulmohar... I guess because they're both fiery red? ?